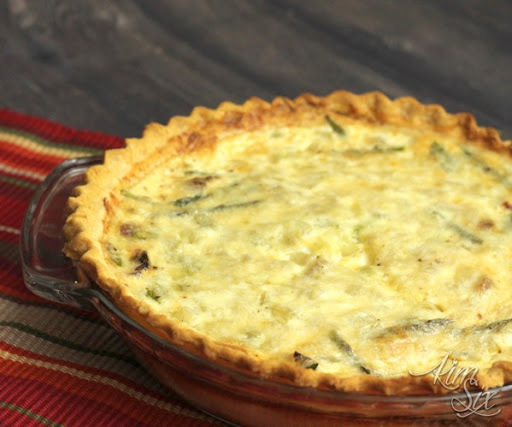 One of my favorite comfort foods is Quiche! I don’t make it very often since the other members of my family don’t really like eggs and I don’t need all the calories. But this Bacon, Asparagus and Parmesan Quiche is a game changer! So for this recipe I added fresh steamed asparagus, as well as replacing one of the whole eggs with 2 egg whites. Sure, 1 1/2 cups of heavy cream plus the butter laden crust is still not “diet” by any means, but every calorie matters! The key to this recipe is pre-cooking a bunch of the ingredients. You need to steam the asparagus, cook the bacon, sweat the onions and pre-bake the crust. Once you have all the ingredients prepped, making the quiche is easy. Arrange the bacon, onions and asparagus in your par-baked pastry shell. And here is a tip I learned from my mom: Put the quiche in the over BEFORE adding the custard mix. This means you won’t spill or need to balance a really full pie pan! The salty bacon and freshness of asparagus combined with the smooth rich egg custard make this hearty quiche a perfect brunch entree. Step 2 Line pie crust with foil and bake for 5 minutes. Remove foil and bake for additional 5 minutes. Remove from oven to cool. Step 3 In separate pans,chop and precook bacon, asparagus and onion. Set aside. Step 4 In a separate bowl combine eggs, cream, cheese sugar and spices. Step 6 Bake at 400° for 10 minutes, reduce to 350° and bake additoinal 25 minutes or until knife comes out clean.